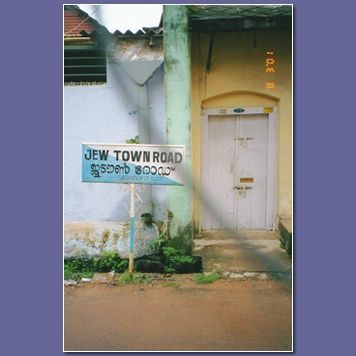 Note the street sign in both English and Malayalam. This is a typical house. The sewage flows at the edge of the street -- note the ramp leading to the front door over the sewage channel. Another view along Jew Town Road. There are many spice shops along this street -- most were once owned and operated by Jews. The name of the art gallery in the photo is "Galleria Synagoga". It had nothing particularly Jewish on display, the Synagogue is around the corner, so the name seemed appropriate. Another business sign along Jew Town Road. 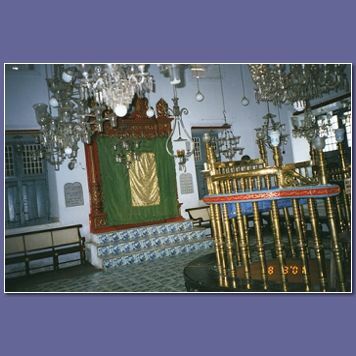 This is the last operating synagogue in Cochin. 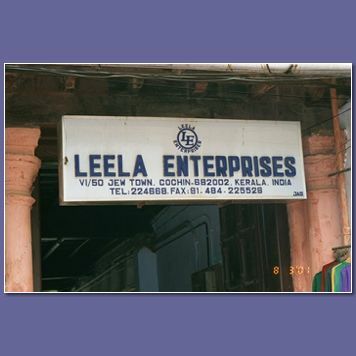 It is one of the major tourist sites in Cochin and is well maintained. There are many beautiful aspects to the facility -- the ancient Chinese pocelain tile floors, the lamps, the wall hangings, the unique clock tower, etc. See the links in the box on upper right of this page for photos, articles and descriptions done by other people. I attended services here on Shabbat. I wanted to comment on what was most unusual to me. 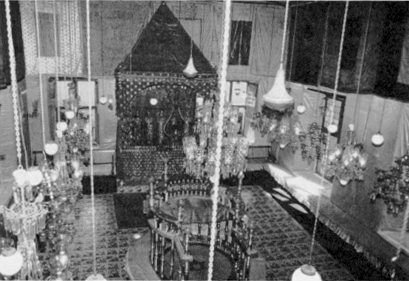 Like all Orthodox synagogues around the world, there are separate seating areas for men and women. Following a common practice, the Paradesi synagogue has men on the ground floor and women one flight above. The Paradesi synagogue (and apparently most other synagogues in India) have 2 areas where the reader stands. This is called a "bima" in Hebrew. The large ornate bima shown above is in the men's section. The only time this was used was for the preliminary service (called "birkhot hashachar" in Hebrew). The remainder of the service including the Shacharit, Torah reading, and Musaf were all led from the upstairs bima. This is adjacent to the women's gallery. It is a fascinating twist on empowering women while remaining true to Jewish tradition. The women were the only ones who had a clear view of the Torah during the reading. As a visitor I was honored with the 3rd aliya (according to tradition). When I was called for my aliyah, I ascended the stairs and stood with the Torah reader and the gabbai at the small 2nd bima. The women sat immediately behind the bima. Jut to be clear -- no women participated in the Torah reading or any part of the service. All roles were done by men. However, changing the location of the bima, changed the dynamic of the service. The women being very close to the Torah, were actively engaged in following along. By contrast, the men were far away -- one flight below. Since they could not see the Torah or the reader, they were much less engaged in following along. This is the exact opposite of what happens in most Orthodox synagogues. I was unable to photograph the upstairs bima because the staircase was closed when I was there with my camera on Friday. I do not take photos or carry my camera on Shabbat. I have included 2 links of photos taken by others to give a perspective on this unique tradition. Looking up towards the 2nd bima. 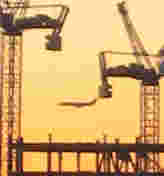 You can't click on this photo directly, but you can copy/paste the URL to view a nice color photo. 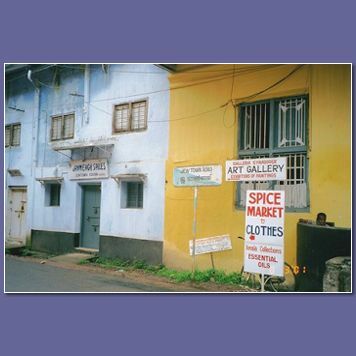 More links with articles and photos about Cochin Jews and their history. Good background on the Jewish community of Cochin. Historic Tablets in the courtyard wall of the Paradesi synagogue. From his will, and the other half from the late Baruch Levi, may his soul be in heaven. 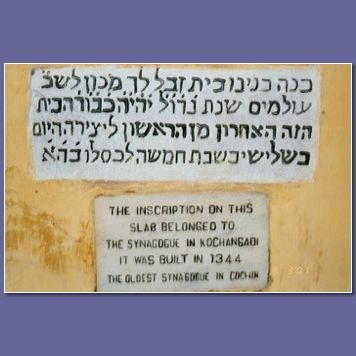 * According to "History of the Jews of Cochin", this tablet was in the foundation of the Cochangadi Synagogue, rebuilt in 1539 CE (over 460 years ago). It was moved sometime later to the Paradesi Synagogue. * The numeric sequence aleph, tav, tav, samech, aleph seems to refer to a year 1861. This puzzled me for some time, since 1861 in the standard Hebrew calendar did not correspond to a secular date anywhere near 1539. Thanks to the excellent book published by Mr. Eliahu Barmouth, I understood that this dating system is based on "minyan ha'shtarot", the dating system used after the Seleucids conquered Israel in 312 BCE. 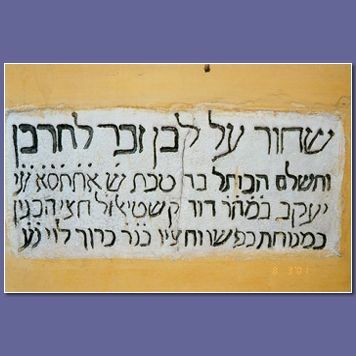 Thus 1861 by minyan ha'shatort corresponds to 1549 CE. in the year 5105. Great it will be, this honored house, the last from the first. Created on Tuesday, 5 Kislev, a house of God. * Most of lines 2 and 3 are a quotation from the prophet Haggai, chapter 2, referring to rebuilding of the temple in Jerusalem. Here it refers to the synagogue in Cochin being rebuilt after the previous one was destroyed. * The first 3 words of the quotation have dots over each letter. These dots serve as markers for the date 5105 in the Hebrew calendar, this corresponds to 1345 CE.